Cari is hosting the second annual Snapshots from a Sunday post. I contributed the least exciting photo and peer pressured Jessica into participating as well. Head over ... if only to marvel over Cari's kids' brilliant/unique/envious names. snack time at the patton's? also, i want a daughter named lotus!!!!!!!!!!!!!! hahahahha. 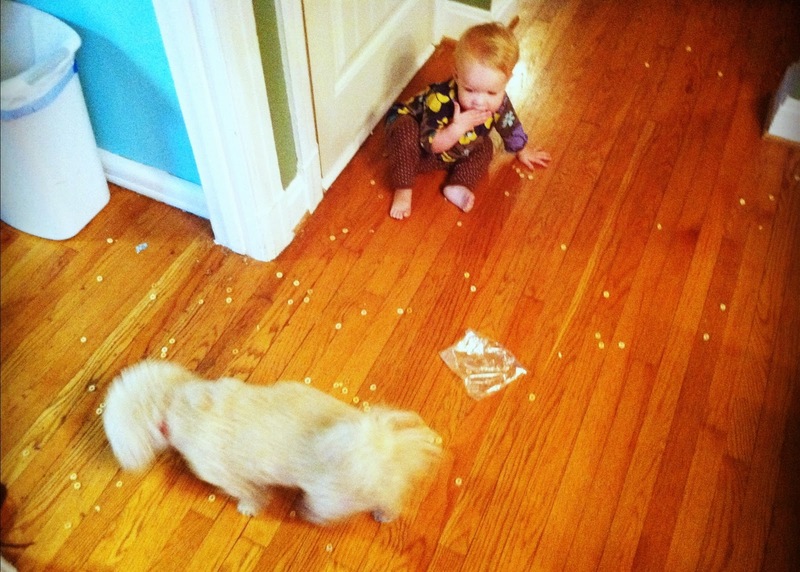 I am not laughing at you this time, but with you since my son and dog pulled the same stunt this morning with the cheerios that were supposed to make my life easier. TWO automatic vacuum cleaners. You are so lucky. this is what dogs are for (well, one reason...the most important reason. maybe). Hey, thanks, Camp Patton!! And not only did you NOT submit the most boring photo, you also did not submit the most bizarre caption. That award goes to my precocious Lotus. Did you read what that loon put? Clearly, she gets it from her daddy's side.